After the game all stones inside a player's area are removed, except the stones that form its boundary. No stone in the boundary can be in atari, but there can be cutting points. The surrounded open points are the territory. 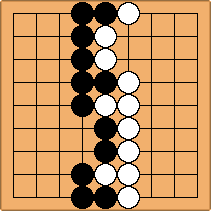 No points are counted in seki, however, and prisoners do not count. The marked stones are removed, leaving the boundaries. Note that, unlike Japanese scoring but like Chinese scoring, a play inside one's territory costs nothing (OC, there may be a better play). This means that almost all questions of life and death may be resolved by play, greatly reducing the necessity for special rulings. But territory scoring is, in general, sharper than area scoring. 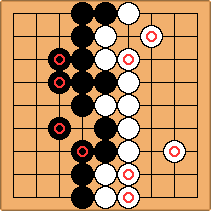 For instance, by Japanese counting Black may have only one option that wins by 1 point, while another results in jigo, but by Chinese scoring either option is just as good, because if Black ties in territory, he will get the last Japanese dame and still win by 1 point. There is no direct comparison between Korean and Chinese scoring, but Korean counting retains the sharpness of territory scoring. It is easier to make a misstep. By Japanese scoring, the ko at a is worth 1/3 point by miai counting, and b is just a dame, worth 0. 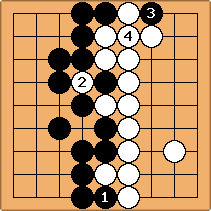 If Black fills the ko at a, the marked black stone is removed and that point becomes territory. 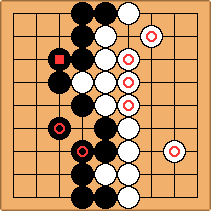 If White takes and wins the ko, the two adjacent marked white stones are removed and become territory. The difference between winning and losing the ko is thus 3 points, and the ko has a miai value of 1 point. 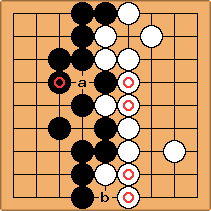 If Black plays at b, the two adjacent marked white stones are part of White's boundary, but if White plays there, they become territory. The miai value of a play at b is also 1 point. 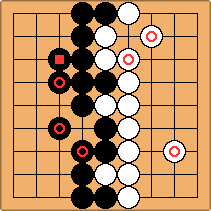 As with Chinese scoring, Black's best play is at b, since he can win the ko later, but the play does not have the same unorthodox flavor that it has with Chinese scoring. 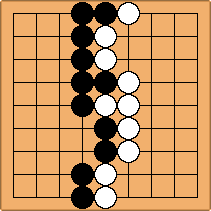 Black has 29 points of territory, as does White: Jigo. In the following diagrams, for simplicity I have let Black have the play at the bottom. First, suppose that Black wins the ko. Each player has 29 points, for jigo. Next, suppose that White wins the ko. Black has 28 points, White 31. Result: -3. The stone in the above diagrams is territory either way. Ah. It becomes territory either way. Thanks, Bill. Both players must pass in this position, and the ko can't be filled with actual play. I guess it isn't filled afterwards, either, as the rules don't say anything about adding stones to form the counting position. In my opinion, it would be more natural to leave the stone in atari and score it that way. Not scoring points in sekis is illogical, too. If those two changes were made (allowing stones in atari and scoring points in sekis), I'd say this scoring system is about as good as area scoring.